Back to school shopping is here and that means it’s time to get to work finding the best backpacks for school, school supplies and lunch boxes. Every year I seem to find a lunch container at the last minute, thinking it will work great, and I end up hating it for the rest of the year. I am sometimes too lazy to go purchase new ones, and so I grudgingly try to snap lids on that just don’t seem to fit, and deal with smells that shouldn’t be lingering for the entire year. Not this year. This year I took the time to do a little research. 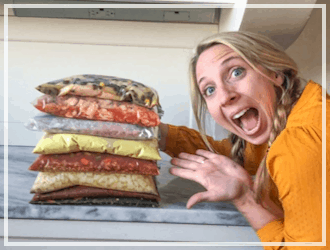 I found 12 cheap lunch boxes for back to school that you can feel good about purchasing and that you most likely won’t regret. 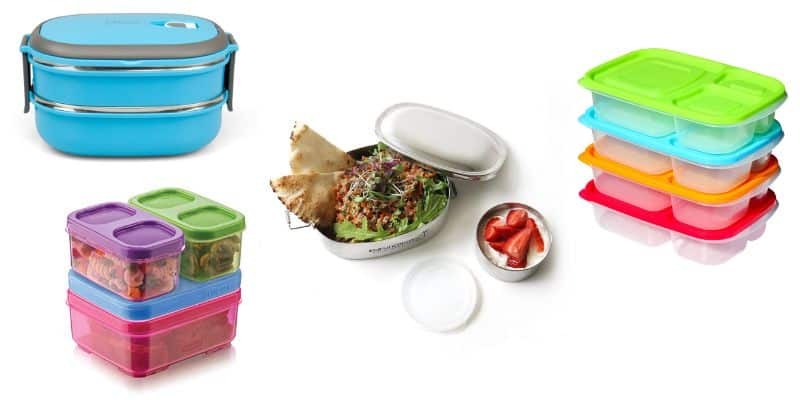 All lunch containers I found have great reviews and are on sale! So, what are we waiting for, let’s get to it! 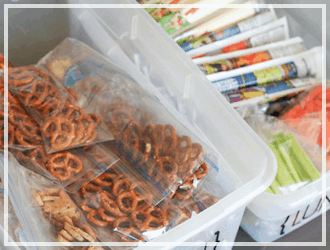 Rubbermaid LunchBlox Kids Tall Lunch Bag Kit– I am in love with this! This guy is designed to make packing lunch a breeze. Each piece snaps together around the blue ice block to keep food cool for hours. I love the fun colors too! This has hundreds of reviews and a 4 1/2 star rating. 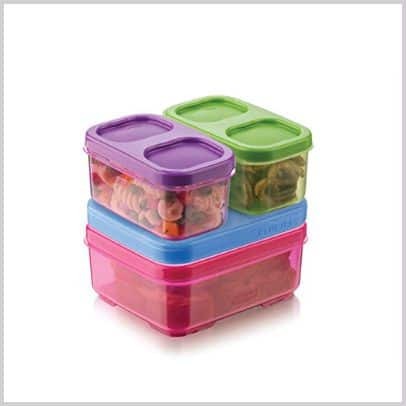 Bento Box Lunch Boxes – 100% Food Safe – Microwave and Dishwasher Safe –This lunch box comes in 4 different colors. It’s stackable design is so cool and comes with silverware which is an added bonus! This one also has hundreds of reviews giving it a 4 1/2 star rating. 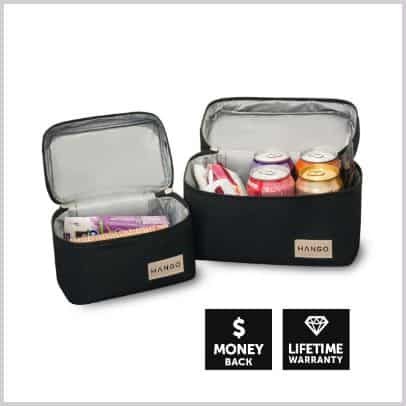 Hango Insulated Lunch Box Cooler Bag (Set of 2 Sizes), Black– This lunch box cooler comes in 2 convenient sizes which is perfect for those days when you pack a smaller lunch. It is made from high quality material and this company believes in giving you the very best! A money back guarantee and a lifetime warranty is how sure they are of their product. What is holding you back? 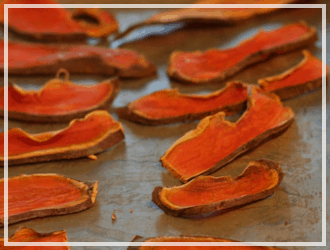 Make sure to use their coupon code UKEPNKJ3 to get an extra 15% off! 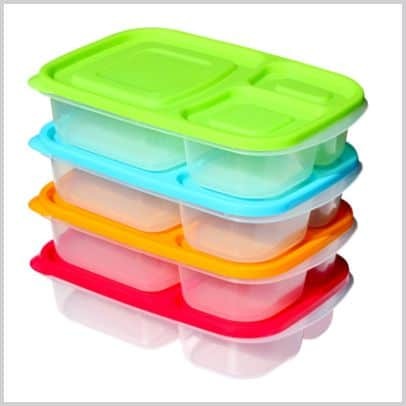 Sunsella Buddy Boxes – Plastic Bento Lunch Boxes – NOT Leakproof – 4 Pack– Simple, easy and kid friendly. I love that this set comes with 4 containers that are all dishwasher safe and stackable. Great reviews at a great price! 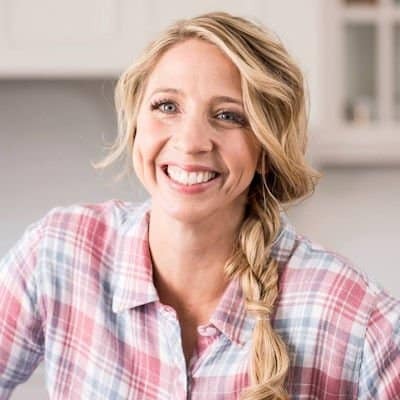 Frigidaire Lunch Box System with Cool Pack – Fresh Lunch On The Go– I love how much food this thing can hold. 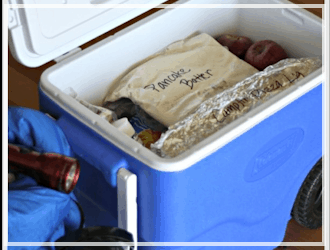 A large compartment on the bottom, an ice pack that snaps into the middle, and a compartment on top that can hold two tupperware containers. This is great for those who like to keep their food separate. 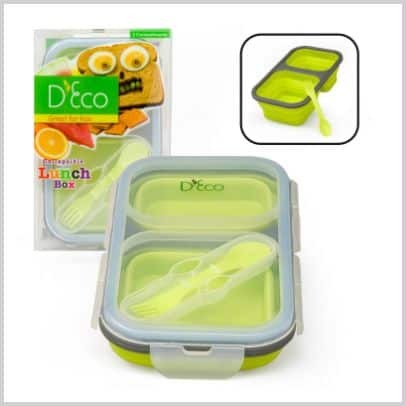 Collapsible Lunch Box- Silicone Kids Food Storage with Two Compartments In Green By D’Eco– I think this is such a cool design. Anything that is collapsable has my heart. I have a hard enough time finding space in my cupboards as is, so this lunch container can magically shrink down to 1/3 it’s size is pretty cool to me. It also includes a spoon and fork that snap right into the lid. Comes in blue, green, and purple! 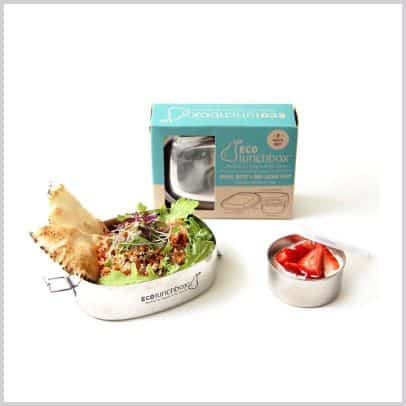 New Wave Enviro Stainless Steel Food Container– This stainless steel lunch container is so sleek in design and just the perfect size to fit any sized lunch. 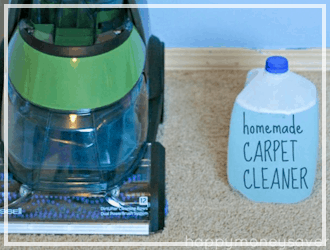 You don’t have to worry about toxins or chemicals with this container and it should last forever. 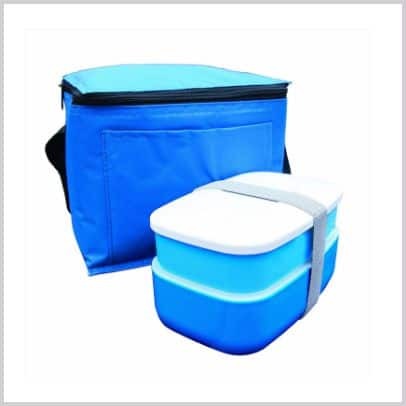 Bags for LessTM Lunch Box in a Cooler Bag with Cutlery Royal Blue– I really like this because it comes with the container and the cooler bag. It also has a grey elastic that fits over the container to give extra protection against leaks and spills. Comes with a spoon and fork too! 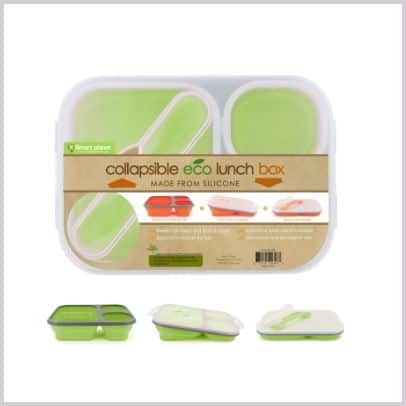 Smart Planet EC-34 Large 3-Compartment Eco Silicone Collapsible Lunch Box, Green– Another collapsible lunch box! 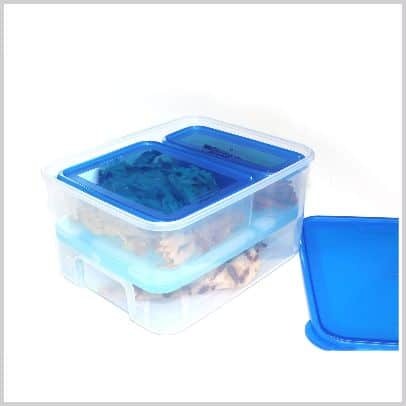 This one is made from silicone, has 3 nice sized compartments for your food and a spoon/fork. I really love the color options on this one. 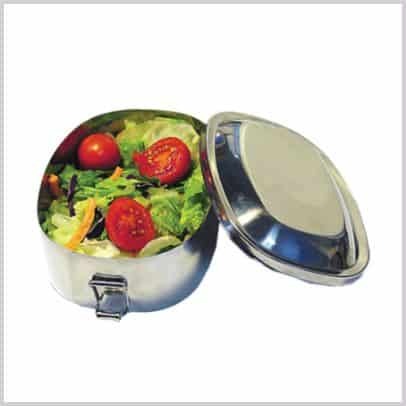 ECOlunchbox Oval– If you love stainless steel containers, this may be the lunch box for you. 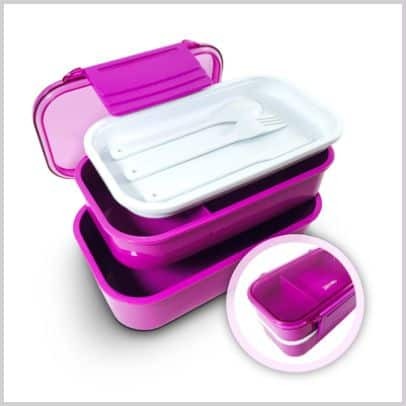 Comes with 2 containers, a large oval lunch box with a 3 cup capacity and a smaller 3/4 cup container that is leak proof. I love the look and functionality of these and it has amazing reviews! 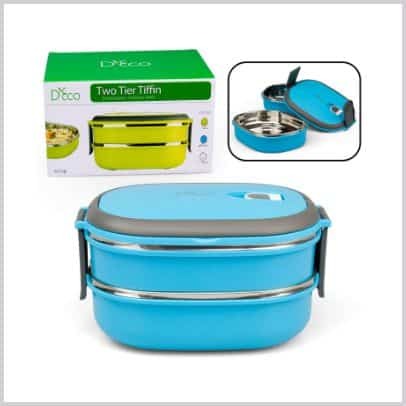 Stacking Lunch Box – Oval Two Tier Tiffin with Vacuum Seal Lid and Stainless Steel Interior (Blue)– Wow! Is this thing really as cool as it looks? It has a stainless steel interior, an airtight seal, and comes with 2 good sized stackable containers. 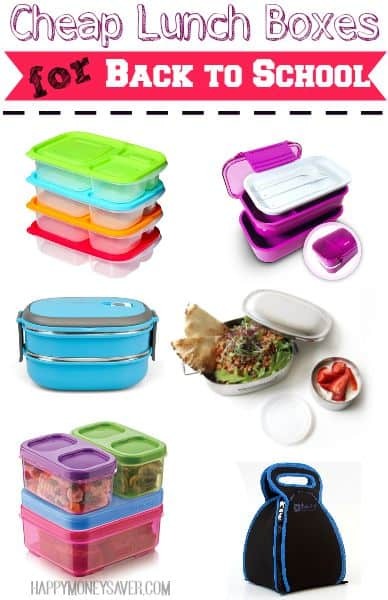 It is also dishwasher and freezer safe and comes in a few different colors. Love it! FlatBox REGULAR Size, The Neoprene Lunch Box that Converts to a Placemat- Black / Blue– I have never seen a lunch box like this. No longer do you have to worry about all the germs on the lunch table. 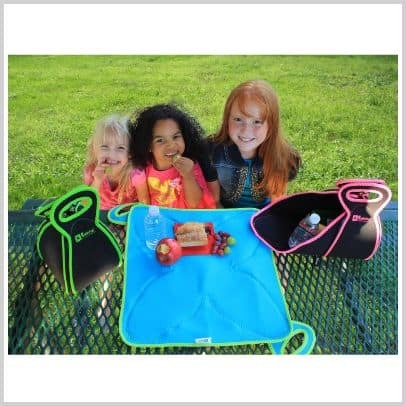 This lunch box unzips and turns into a placemat. What if it gets dirty? 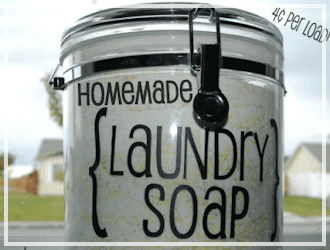 Just throw it in the wash because it is machine washable! What an amazing product! 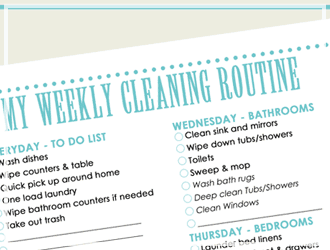 Great reviews by hundred too so you can feel safe with this option.